"We did not watch it, and it was not reported. We did not hear about the character," said Peskov, when asked about Putin's reaction to the appearance of the character of the Russian president in the series’ storyline. “House of Cards” is an American political drama developed and produced by Beau Willimon. In the third season, which was released on Feb. 27, a new character – the president of the Russian Federation Viktor Petrov – features prominently in the plot. 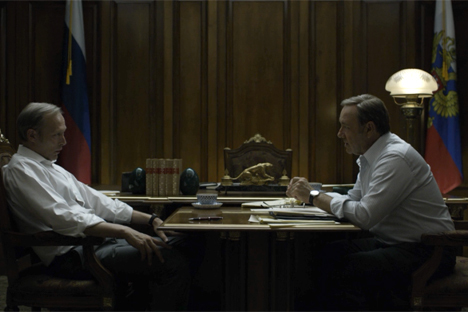 Petrov, played by Danish actor Lars Mikkelsen, is widely assumed to be modeled on Putin. Two sources close to the group producing the TV show said that Tolokonnikova and Alekhina have taken part in the shooting and will appear in a Season 3 episode.